WHERE IN THE WORLD IS . . .? Since the Schwenkfelders came from Silesia, Germany, we are familiar with the names of towns in German. However, when the Polish took over that portion of Germany, the names of the towns as we knew them were changed over to Polish names. 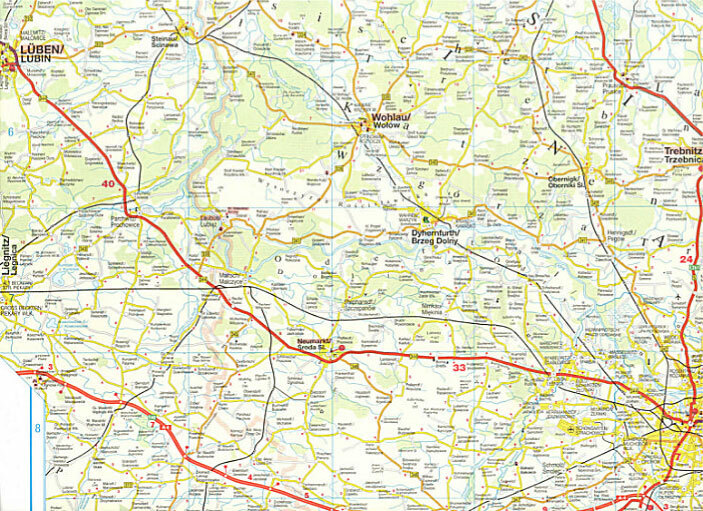 Maps of Middle Silesia area and Lower Silesia in Poland and Czech Republic published by Höfer Verlag are available in the library of the Schwenkfelder Library & Heritage Center. Below is a partial list of the German names with the present Polish names next to them. Map of Harpersdorf/Twardocice with German and Polish town names. 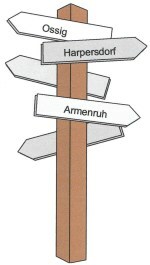 From Map PL 006, Höfer Verlag, 63112 Dietzenbach. Take Route 364 southwest to Goldberg/Zlotoryja continuing through Hermsdorf a.d. Katzbach /Jerzmanice Zdroj. Stay on Route 364 to an intersection where Pilgramsdorf/Pielgrzymka is off to the right and Harpersdorf /Twardocice, Armenruh/Rochow, and Lang Neundorf/Dluzec are off to the left. Turn left here and look for signs for Twardocice . In Harpersdorf/Twardocice at the remains of the Refuge Church in Harpersdorf , there is a dirt road intersection. Take the dirt lane in the direction of the hill (opposite the Church). About ¼ mile up the hill on the right, in the thicket, you should find the Viehweg Monument. Take Route A4/E40 west. Cross over Route 3 south of Liegnitz/Legnica. Turn southwest onto Route 364 southwest of Liegnitz/Legnica. Continue as above. Map of Ossig/Osiek with German and Polish town names. 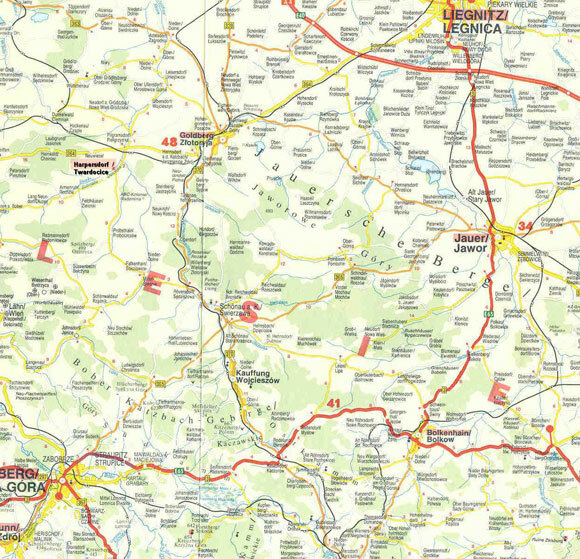 From Map PL 006, Höfer Verlag, 63112 Dietzenbach. From Liegnitz/Legnica go north to Lüben/Lubin. From Lüben/Lubin take Route 344 southeast for approximately 3 to 4 kilometers where there should be a road to the right which goes to Ossig/Osiek; the road to the left would take you to Klaptau/Klopotow. Take Route 344 northwest towards Lüben/Lubin for approximately 70 kilometers. About 3 to 4 kilometers before reaching Lüben/Lubin, there should be a road to the left which goes to Ossig/Osiek; the road to the right would take you to Klaptau/Klopotow.